Movie ini berkisarkan kepada penindasan Orang Asli di Amerika. Penduduk Asal yang telah ditindas dan hak mereka dinafikan. Jikalau Bangsa Borneo daripada Negara Sabah dan Negara Sarawak tidak mempertahankan hak di bumi sendiri, nescaya hidup dan nasib akan berakhir seperti Orang Asli Amerika yang dikenali sebagai Red Indian. Sila tonton video ini dan sebarkan. 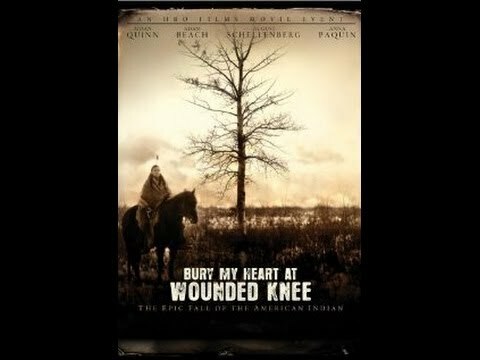 Bury My Heart at Wounded Knee is a 2007 television film adapted from the book of the same name by Dee Brown. The film was written by Daniel Giat, directed by Yves Simoneau and produced by HBO Films. The book on which the movie is based is a history of Native Americans in the American West in the 1860s and 1870s, focusing upon the transition from traditional ways of living to living on reservations and their treatment during that period. The title of the film and the book is taken from a line in the Stephen Vincent Benet poem "American Names." It was shot in Calgary, Alberta, Canada. While Eastman and his future wife Elaine Goodale (Paquin), a reformer from New England and Superintendent of Indian Schools in the Dakotas, work to improve life for Indians on the reservation, Senator Dawes lobbies President Ulysses S. Grant (Thompson) for more humane treatment of the Indians. He opposes the adversarial stance of General William Tecumseh Sherman (Feore). The Dawes Commission (held from 1893 to 1914) develops a proposal to break up the Great Sioux Reservation to allow for American demands for land while preserving enough land for the Sioux to live on. The Commission's plan is held up by Sitting Bull's opposition. He has risen to leadership among the Sioux as one of the last chiefs to fight for their independence. Dawes, in turn, urges Eastman to help him convince the recalcitrant tribal leaders. After witnessing conditions on the Sioux reservation, Eastman refuses. The prophet Wovoka (Studi) raised Western Indian hopes with his spiritual movement based on a revival of religious practice and the ritual Ghost Dance; it was a messianic movement that promised an end of their suffering under the white man. The assassination of Sitting Bull and the massacre of nearly 200 Indian men, women and children by the 7th Cavalry at Wounded Knee Creek on December 29, 1890 ended such hopes. Henry L. Dawes' wanted to increase the cultural assimilation of Native Americans into American society by his Dawes Act (1887) and his later efforts as head of the Dawes Commission. During the 47 years of implementing the Act, Native Americans lost about 90 million acres (360,000 km²) of treaty land, or about two-thirds of their 1887 land base. About 90,000 Indians were made landless. The Implementation of the Dawes Act disrupted Native American tribes' communal life, culture, and unity.